give the bike a unique look from behind. When Yamaha engineers' started the TDR development project in 1985, they were faced with the task of creating a new-concept motorcycle which would break away from the racer-replica trend of the 1980's and, most importantly, reemphasize the "FUN" aspect of motorcycling. Working on the premise that the TDR should be capable of being ridden on all types of road surfaces in a practical and enjoyable way, their target became clear. They had to build a motorcycle whose performance created a new dimension in terms of acceleration, manoeuvrability, handling, stability and braking, and which also enabled the rider to extract the maximum in driving enjoyment from everyday use! TDR 250 comparing to a Lotus Super Seven. agile handling, build for narrow roads. To build such a motorcycle whose performance envelope should encompass the various conditions as envisaged by TDR was not going to be an easy matter for the simple reason that TDR was to be the first of its kind, indeed a new-concept! The development team considered how to approach the project and decided, that as this motorcycle had to combine road and off-road features in a new way, they should start by reassessing the positive and negative aspects of road and off-road bikes. To do this, they chose a novel method by taking a TZR25O, RD25OR, DT200R and Serow (XT)225 to Hokkaido, Japan's northernmost island. They considered Hokkaido to be a perfect testing location by virtue of its European like climate and variety of roads, highways, secondary mountain routes, green lanes and off-road areas. They rode the TZR25O on green lanes to see how it reacted to such conditions, and the Serow 225 on a highway for many hours to see how the riders reacted. Naturally riding in such circumstances meant that they experienced discomfort to a greater or lesser degree. Individual experiences were discussed, the main theme being how to convert discomfort into comfort in order to achieve an outstanding new concept dual-purpose motorcycle. Finally, a consensus was reached and TDR's technical concept was fixed, it was to be engineered to be almost the equal of TZR25O in terms of driving capability, whilst also being a good match for DT or XT models in its off-road manoeuvrability. In achieving this, the engineers considered TDR would be the "ULTIMATE DUAL". of the bike on different terrain. The rules were similar to today's supermotard races. 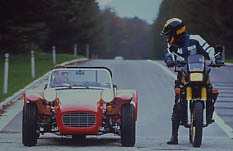 In beginning chassis development, the engineers had a choice; either start with a conventional road or off-road chassis, and develop TDR from one or the other. Having decided to give considerable street bias to TDR, they chose, not surprisingly to start with a road chassis because an important priority was high speed stability. Off-road handling characteristics would then have to be built in as much as possible within this chassis base. In considering the actual frame design, a compromise had to be reached between the high lateral rigidity of a road frame and the high longitudinal rigidity of an off-road frame. 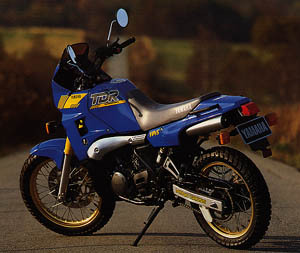 In TDR's case the frame rigidity of an off-road bike was chosen whilst the design followed that of a conventional road frame. This was in the engineers' opinion the ideal compromise for both high-speed stability and excellent off-road manoeuvrability. So a conventional double-cradle tubular steel frame was designed and built and actually bore a dose resemblance to that of the first RD25OLC. However testing showed that no existing design standard could be applied to TDR's frame rigidity as, after all, it was a new-concept. And, mid-way through development, testing showed that the frame's tube diameter had to be substantially increased. Also, special care was taken when assigning design priority to various chassis components which in themselves made a unique design approach necessary requiring less regard for aerodynamics and motocross manoeuvrability.